The "Grand Ole Ham" lifetime service award winner for 1998. Known as "Rollie" to his many friends in the Amateur family, he has been licensed for 47 years and has also been a member of Navy MARS for 36 years and Army MARS for 41 years. For more than 25 years, he was an operator at the Franklin Institute Science Museum's Amateur Radio exhibit W3TKQ (now W3AA). Although he has turned over trusteeship of the station callsign to a younger ham, Rollie still volunteers one day each week at the Museum. Now in his late 80s, Rollie served 24 years in the U.S. Navy, followed by employment with RCA and GE until his retirement in 1972. Since then he has been an active ambassador for Amateur Radio through W3TKQ / W3AA to the thousands of museum visitors of all ages. Another interest in his life is genealogy, and he has traced his lineage through many generations. 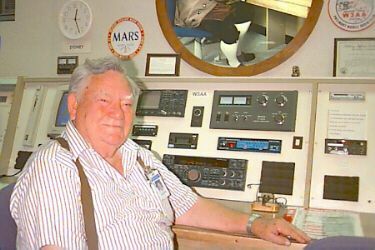 The Amateur Radio community is indeed fortunate to have a gentleman like Rolland Madara W3PWG on our family tree! Kay Craigie, WT3P, ARRL Atlantic Division Director. Rollie wrote the following for the 40th anniversary of the station. On March 5, 1992, W3TKQ will be forty years old, and has occupied four different areas, with five rebuildings of the station. The original location was a horseshoe shaped counter with the operator in the middle, and located where the present cafe is on the second floor. Just a receiver and transmitter for hf, and later a couple of other items. The first time I saw it was in 1953 when my wife and I visited the Institute. In 1962 that whole room was rebuilt to house the Bell Telephone exhibit, the weather station, and a new W3TKQ with a beautiful Collins console set up, plus a ten-meter cabinet for Phil-Mont operations. The station was adjacent to the manmade lightning exhibit, which was also demonstrated by the same operator. Nelson Schurr was the chief operator then, with help from Paul Singewald, Les Ransom and Sam Moskowitz. Les dropped out in 1972 and I took his place. Then Nelson decided to retire, and Frank Whitten took his place. In 1978 that room was dismantled and the lightning and W3TKQ moved to the east end of the electrical room at the other end of the building. We operated there for several years until they decided to rebuild that room, and we were banished to the old storeroom up on the fourth floor. Sam had dropped out due to illness, and Jack Kramer joined us, and later John Russell. We did the best we could with what we had. Then we all got laid-off, and the "fun" started. We now have a beautiful station in that old storeroom, with all the latest equipment, and a lot of volunteer operators who are finding that it is an interesting place to work and meet the public. In 1977 all the operators of W3TKQ were also members of Navy Mars. They asked permission from the Phil-Mont Mobile Radio Club to apply for a Mars call. The requirements were that the trustee and two club members must be Mars Members. I was trustee at that time, and my Mars call was NNN0ARF. Sam Moskowitz, K3RTR was NNN0UKP; Frank Whitten, K3TEF was NNN0UCL; and Fred Fowler, WA3AAL was NNN0XYU. The permission was given, and in November 1977 they started operating with the Mars call NNN0QPN. Sam and Fred are both now Silent Keys, and Frank, who is 91, does not come in any more since he had a stroke. In almost nineteen years of service we've filled four log books, and passed quite a few messages between servicemen and their families. In October 1996, I completed 34 years in Navy Mars.